In an age when climate denial, an increasing distrust of immigrants, and the epithet “fake news” dominate the headlines, the eloquent arguments ventured forth in the pages of the anonymous Refutatio major (c. 1517–1525) play neatly against the public consciousness, reminding us that, even now, there are still those who hold to a view that the world is flat and the moon landings were fabricated. But none of our contemporary doubters or conspiracy theorists who peddle their “alternate facts” would deny the existence of the New World. . . However, in the decades that followed Christopher Columbus’ fated encounter with a land mass that would soon turn long held assumptions about the geographical reality of the world on their heads, what sort of skeptics might have crawled out of the woodwork? Well, if you accept the premise French author and playwright, Pierre Senges, is prepared to offer alongside his spirited “translation” of this curious treatise claimed by no one but attributed to Antonio de Guevara, we have a Renaissance-era Latin document that purports to call into question the veracity of the reports, artefacts, and individuals ferried across the ocean from this distant new land by a steady stream of seafaring Spanish and Portuguese adventurers, colonists, and missionaries who have disappeared and reappeared over the watery western horizon since the reported discovery of the Mundus novus. And what an imaginative and persistent defense is waged in this apparent “Epistle to Charles V,” now translated into English by Jacob Siefring as The Major Refutation. The new world, an enchantment? however when John Day, a good sailor no doubt, but a geographer of little import, announces that somewhere to the west islands have been found where “grass grows,” he is either smirking with deceit, or mocking our rulers, to whom he extends an offer of six square yards of lawn in the guise of a vast kingdom. These men go off into the horizon, where they lose their heads, exert themselves furiously, ravish Indian women, move mountains and entire populations, drown a thousand sailors in their wake, and then come back to us, swearing in magnificent syllables that grass grows on these lands and that in their environs, by the grace of God, rain falls from on high. Senges is a prolific French writer, but to date little of his work is available in English. With a spirit akin to Borges and Calvino, Senges frequently exploits the possible, potential, and unfinished spaces that exist in history or literature. That porous line between fact and invention is blurred with a nimble oratorical style that lends itself to work with a sharp satirical, critical, and philosophical edge. Throughout the text, the personages and recorded events are real, but it’s the dogged determination to prove that the celebrated New World is an elaborate hoax that forms the heart and soul of this wildly entertaining feat of double imposture. To the observer, these textual games and universal decrees sitting alongside and contradicting one another, these privileges to a single treasure granted to so many, these supposedly definitive treaties that are deprecated before the year is even up, that manner of signing at just two streets’ remove a couple of decrees that mutually refute one another, all the while perceiving that the world carries on under the weight of such numerous paradoxes, to the solitary witness all of this looks as much like naiveté, as much like a superior ruse. Because to adopt a proprietary attitude towards invisible islands is either proof of blindness, become lately a fashion of the courts & palaces, or it is a deliberate strategy, dictated by the crafty to the envious; to delude the people, it would hence be a question of acting as though the chimerical continents were so valuable they were worth the price of humiliations on their behalf, worth the aristocrats sharing trading posts and territories, like barkers sharing stalls in the marketplace. The principal reason for the invention of the new world would surely be to send off into the ocean a portion of our great surplus of useless men, who fill our countrysides, our cities, and betwixt the twain our faubourgs, with the speed of a spreading plague. . . . The new world and the enticing advertisements which speak of it so fantastically invite all these beggars & jobless, worthless players to board dinghies, strap a sail to their torso and head due west, without demerit. A steady stream of disfigured men, ugsome-faced knaves and scrawny blackguards have thus quit terra firma, this world for its beyond, in prestigious and ruined galleons. From the opening “Editor’s Foreword” that places the Refutation into historical context, to the scholarly “Afterword” that vigorously defends the case for Antonio de Guevara, confessor to Charles V, as the probable author while considering less likely alternate candidates, Senges is essentially presenting a carefully designed meditation on the nature of truth—on that which is credible and that which is contrived, on belief and doubt. Selecting de Guevara as his preferred composer, a historical figure with an attempted forgery to his credit, and allowing him to imply that his faith in his own argument is perhaps less than genuine, adds depth to the layers of a deception designed and executed as one thoroughly intelligent and entertaining whole. Of course, the release of the of “English Version of Refutatio major” in late 2015, ten years after the “original” French version, is especially timely. Conspiracies abound. In saecula saeculorum. 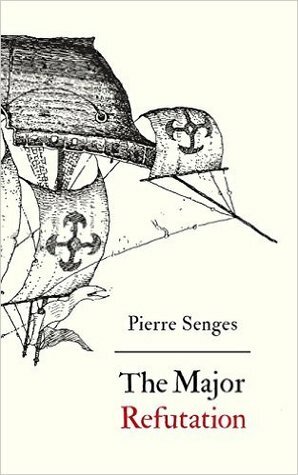 The Major Refutation by Pierre Senges, translated by Jacob Siefring, is published by Contra Mundum Press. And, for the record, the book design and typesetting is exceptional. Did you know that there’s a conspiracy theory that Australia doesn’t exist? Ah, it’s a weirdly wonderful world we live in! It makes you wonder. BTW, I will send you an email tomorrow. This is on my TBR pile, arriving in the mail at the same time as his “Fragments of Lichtenberg” which I chose to read first. I loved it, just don’t have your eloquence to review it so it’s one on the “to be reviewed” pile!!! Glad we’ve both enjoyed Senges at the same time. You had me at “Renaissance-era Latin document.” Going on the TBR pile immediately. Thanks for the great review and bringing this to my attention! I look forward to hearing what you think of it. I imagine there are double entendres I missed for lack of Latin (and possibly more in the original French book). My knowledge of this period of history is scant too so I found myself googling the key figures, events of the era. Hi, I am a little confused, is this a translation of a real renaissance document or not? Wordery has it listed under history, but you seem to be partially implying that it is invented? It is one of those books that really blurs the line we like to draw between fiction and nonfiction. I would personally consider it historically robust satire. If you have a dry sense of humour, it is very funny. Senges is a writer who often takes fragmented or unfinished documents and imagines filling in the gaps. If a document like the Refutation did not exist, it could have.